The document has no overall title, and gives no indication of its source, but it derives from a batch of Foreign Office briefing documents, including material from the Information Research Department (for whose activities, financed from the budget of the Special Intelligence Service, otherwise MI6, see The Times, 17 August 1995; and also Michael Cullis's obituary of Sir John Peck in the Independent, 20 January 1995). [ Renown Akido Society, Hillingdon, the first Akido society in the UK. ] Duplicated Typed Circular explaining Japanese terms, wiith manuscript annotation (by founder Ken Williams?). Renown Akido Society [ Hillingdon ]. Between 1966 and 1969. An interesting artefact from the early days of Akido in the United Kingdom. Akido was introduced into the UK 1955 by Kenshiro Abbe Sensei at the Hut Dojo in Hillingdon. His first student was Ken Williams. In 1957 Haydn Foster joined the Hut and continued to teach there until his death in 2011. The Renown Society was formed in 1966 by Williams after Abbe returned to Japan. This was the original society teaching Akido in the UK. The Renown Society broke up in 1969. 4pp., foolscap 8vo. [ A Royal Navy engineer in the Far East and Pacific, 1882-1891. ] Account book of George Parsons, latterly Chief Engineer of HMS Champion, recording his personal and professional expenses on various tours of duty. Between August 1882 and May 1891. At locations including Port Said, Alexandria, Portsmouth, London, Suez, Malta, Hong Kong, Yokohama, Tokyo, Vladivostock, Shanghai, San Francisco, Vancouver, Esquimault, Honolulu, Halifax. Further accounts,1889-1911. 73pp., in a 12mo account book with printed red rules, in dark marbled boards with black cloth spine. Internally in fair condition, aged and worn, in heavily worn binding. Inscribed 'G. Parsons' twice on front endpapers. (Parsons' Royal Navy certificates as an assistant engineer (1872) and engineer (1878) are held by the National Archives.) The present volume contains a full set of accounts, 1882-1891, over 52pp. ; less-detailed accounts, 1898-1911, over 8pp. ; desultory accounts over 5pp., including two-pages of the 'Furniture Fund | H.M.S. Diplomatic and Consular Reports on Trade and Finance. Japan (1896). No. 1937. Pamphlet, stitched as issued, sl. foxed and dusted, mainly good condition, 22pp. , 8vo. Report for 1896. [ Francis Elgar, naval architect. ] Autograph Letter Signed [ to W. J. Fisher ], regarding the fund set up at the death of Harold Frederic. On letterhead of 18 York Terrace, Regent's Park, London. 3 January 1899. 1p., 12mo. Bifolium. In good condition, with light signs of age. He is enclosing a cheque for two guineas towards 'The Frederic Fund', and writes that he had 'the pleasure of often meeting Mr Harold Frederic at the Savage Club some years ago'. He was 'deeply grieved to hear of his sad & untimely end'. He hopes enough money will be collected to be an 'appreciable help to his widow & children'. The letter relates to a celebrated Victorian scandal. In 1884 Frederic had come to England with his wife and five children as the London correspondent of the New York TImes. Report and minutes both without place and date, but referring to a meeting in London on 22 November 1937. Despite the fair amount of attention bestowed on the 'Anglo-Japanese Conversation' - the secret negotiations between the British government and the Japanese ambassador at the start of the Second Sino-Japanese War - it is only with the discovery of these two documents that it can be established that the two countries continued with informal negotiations until the fall of Nanking. [ Nanking; Japan ]Long Autograph Letter from English-born jurist/adviser to Japan on foreign affairs Thomas Baty to 'Cooper', presenting a detailed defence of the Japanese position after the Nanking Massacre, and of Franco in the Spanish Civil War. 'Tokio [Tokyo] 1 October, 1937'. A letter of the first importance, as Baty had been since 1916 foreign legal adviser to the Japanese Government (following the death of Henry Willard Denison), and had been part of the Japanese delegation to the 1927 Geneva disarmament conference. Such was Baty's support for the Japanese position that the British Government seriously considered trying him for treason following the Second World War, choosing instead to revoke his British citizenship. 5pp., 4to. The first five pages of the letter only, and so lacking the signature, although Baty is without doubt the author. [Printed Leaflet P.2327B.] Communication with Prisoners of War and Civilians in Japan and Japanese-occupied Territories, and other Service personnel and Civilians believed to be in Japanese hands. General Post Office, July 1942. 'H. & S. Ltd.' '7/42', i.e. July 1942. 2pp., 12mo. Printed on both sides of a single leaf. Fair, on aged and creased paper. Giving a list of addresses to which letters and postcards 'may be sent post free to Service personnel and Civilians known or believed to be in Japanese hands'. '[...] To avoid delay in Japanese censorship, no one should write more than once a week'. With an example of the way in which to 'address you letter', if 'the internment camp address is known'. Scarce: no copy on COPAC or WorldCat, although the Imperial War Museum does have a similar Leaflet P.2280E (1943), relating to prisoners of war in Europe. 16pp., 12mo. Stapled. In printed pink wraps, with map on inside back cover showing 'The Prisoner of War (Far East) Enquiry Centre' at Curzon St House in Mayfair. In fair condition, on lightly-aged paper in worn wraps with creasing to one corner. Published by Japanese Criminal Policy Association. Printed by Printing Bureau, Ministry of Finance. 1964.
ii + 133pp., 8vo. Photographic portrait of the author as frontispiece. Fair, in lightly-worn blue leatherette binding, gilt. Inscription in English on front free endpaper: 'To National Committee for the Abolition of Capital Punishment, from Akir [sic] Masaki L.L.D. | 12. 22. 1969'. In a three-page 'Preface to the English Edition', dated July 1964, the author explains that the Japanese edition of the book was first published nineteen years before. [Printed pamphlet.] A Sociological Experiment among Factory Girls. 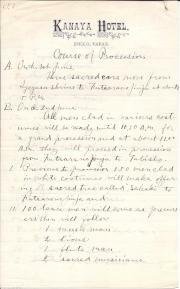 A Report of the Matsuyama Factory Girls' Home. 12pp., 4to, plus three leaves of plates on art paper. Stapled, in original buff printed wraps. A fragile item. Fair, on aged high-acidity paper, in chipped and worn wraps. Images captioned 'The First Photograph of the Sympathy Society', 'At School', 'At Play' and 'The Home'. Sections on the conversion of Shinjiro Omoto, and the 'Sympathy Home' ('Dojokwan'). Final 'Financial Statement' and 'Plans for Enlargement'. No copy on COPAC. Anonymous Manuscript, in English, giving details of the 'Course of Procession' in a Shinto festival, Nikko, Japan, 1 and 2 June [no year], 'from Iyeyasu [i.e. Ieyasu] Shrine to Futaarano [i.e. Futarasan] Jinja' and from 'Futaarano Jinja to Tabisho'. 1 and 2 June [no year - late nineteenth century? ]; on lettherhead of the Kanaya Hotel, Nikko, Japan. 8vo, 3 pp. On the rectos of three letterheads of the Kanaya Hotel. The three leaves attached by string to one corner. Good, on lightly-aged paper. Headed 'Course of Procession', and divided A and B. Section A merely reads 'On the 1st of June | Three sacred cars move from Iyeyasu Shrine to Futaarano Jinja at about 5. 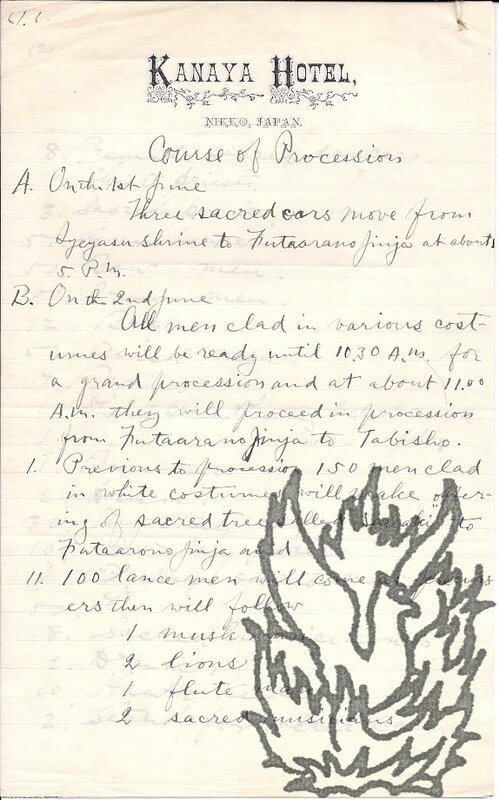 P.M.' Section B begins 'All men clad in various costumes will be ready until 10.30 A.M. for a grand procession and at about 11.00 A.M.
Pro-Japanese manuscript on the Manchurian Crisis, entitled 'John Chinaman & <?> Jap at Grips. How the Trouble Arose. Brigandage versus Enterprise'. 12mo, 11 pp. Text clear and legible. On one side each of eleven leaves of lightly-aged paper, with slight creasing at foot of some leaves. The pages are numbered, and the article is incomplete, cutting off halfway through a sentence on p.11. An interesting and well-informed analysis, from an unashamedly pro-Japanese viewpoint. "Papers read on Various Occasions", Periodical Publications, bound into one volume. Hf.lea, worn, raised bands, red lea., gt spine, title as above, some foxing and damage in parts, mainly good. Contents (listed on front endpaper in Abel Heywood's hand): "Four Days in Iceland"*, "A mountain walk in Norway"*, Scandanavian Stories about Huldre"*, " Notes on Japan and the Japanese"*, "Sveningdael"*, "Trout-fishing in Norway", "Fish out of Water", "A Night at the Lochinvar", "One Way to the Tweed", "A Fishing Adventure in Japan" [not listed in Contents], "The Vision of Fishes", "Fishes Ee-Seet", "Norway Re-visited". Good, in felt-tip pen on piece of blue paper, roughly 8 x 13 cms, with the slightest discoloration at extremities. Autograph Letter Signed ('S. Kato') in English to [?] Beaufort. 3 April 1919; on business letterhead. One page, octavo. On aged, grubby paper with minor staining at foot. He has spent 'all his monney for prints & Books I bought at Sale last Week. I have no balance in my Bank at all. (ganz nichts) if you are not inconvenient [sic] Please bring some L. S. D. on Saturday next'. Postscript: 'My business is Ratton N. B. G.' It is thought that Kato obtained a large portion of the Japanese prints for Sir Edmund Walker's celebrated collection. Explorer in Japan. Good signature on pasaper, 3 x 1" approc. With: additional pencil note "Distinguished explorer in Japan made first ascents of many mountains" ascribed on the paper on which the signature is laid sown to "Dr [Howard] Somervell of Mt Everest Expedition" (1953 expedition, Somervelld.1975).